Excellent overall study of the events leading up to, during and after the Norman Conquest of England. 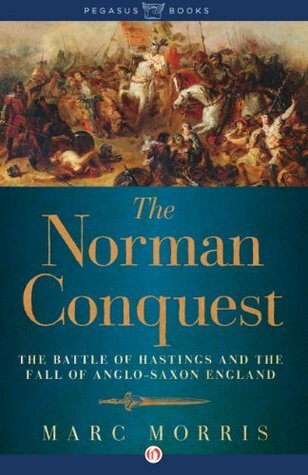 An acknowledged neophyte on this subject, I learned quite a bit from The Norman Conquest: The Battle of Hastings and the Fall of Anglo-Saxon England and appreciated author Marc Morris’s frequent pauses to critically assess the accuracy of source documents and the motivations of the various writers. The narrative moved crisply throughout and the author’s prose was clear and very readable. The adherence to a linear timeline caused this reader a few moments of confusion. With the large cast of characters involved, participants were introduced, did something and then disappeared only to reappear much later on, often necessitating page flipping (or Kindle searching) to become reacquainted. Given the sheer number of people involved throughout the period in question this was perhaps unavoidable; I don’t fault the author and merely offer this as an observation for future readers. I’d recommend this book to anyone interested in learning about the Norman Conquest or the early history of England and the British Isles. As a reminder, I don’t spend as much time on reviews of traditionally published books. I felt the Norman Conquest book handled it well, didn’t it? If you’re interested Great Courses DVDs are often available from the library (at least they were in Oregon). Some of those are the best lectures on the topic I’ve ever received, particularly the one about the Carolingian dynasty that helped lead up to confusion and interconnectedness at this time.